After a rebound in the second half of April, U.S. equities (+8% year to date) stabilized, while global markets excluding the U.S. continued to push higher, driven by a relief rally in European markets after the French election on May 7th. When the stock market rises, its volatility tends to drop – which is what happened in recent months. Implied volatility priced by S&P 500 options (the VIX index) dropped to around 10% (see chart), the lowest in ten years. Implied volatility can be viewed as a measure of investor sentiment, and some commentators have taken this volatility drain as a bearish sign. I’d like to point out two things in this regard. First, the VIX follows actual (“realized”) volatility of the S&P 500, which has dropped significantly over the course of this rally: 3-month trailing volatility is now around 7%, compared with 21% over the past ten years. Second, the last time the VIX dropped to 10% was in Nov-2006, and it remained low until Feb-2007 while the index continued to rise. The volatility drain does point to significant optimism, and we know that it will reverse sooner or later. However, a more important question is when – it may reverse in the short term but may not point to immediate danger. 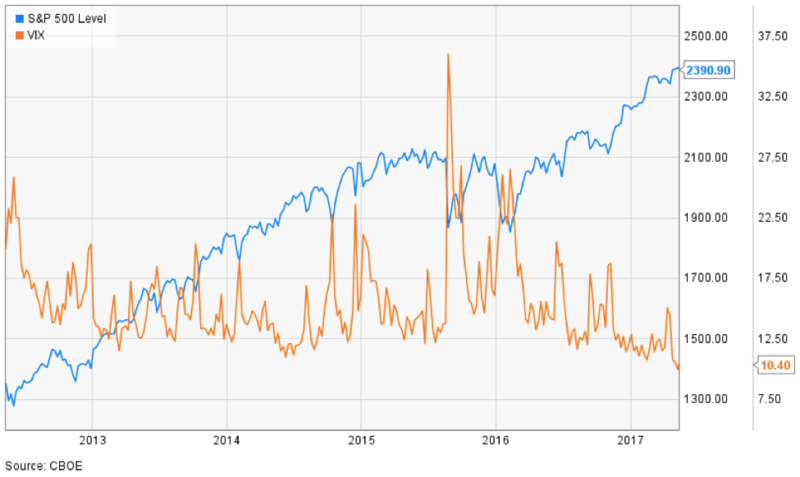 Finally, it is important to account for investor sentiment, and our equity model includes measures – the AAII Bears/Bulls and the Put/Call Ratio – that historically tend to be better market predictors than the VIX. The Put/Call Ratio, at 0.75, indicates very bullish stance by traders, and our statistical model calculates a negative effect of this factor on expected 6-month return for the S&P 500 of -0.9%. Measured as standard deviation of daily S&P 500 returns, and annualized.